Although most homeowners are well aware that they should ventilate their attic, often times, when asked, they really don’t know why. An attic that is sealed with little or no ventilation is a bad situation for the occupants of the home and for the building structure itself. There are many advantages in having good attic ventilation and there are no disadvantages. One of the key components of good attic ventilation is having soffit vents. Why should you have soffit vents? In the summer time, with the sun baking on the roof of the home, attic temperatures can rise to well over 100 degrees Fahrenheit. Soffit vents will help to keep the attic cooler and a cooler attic means that you will require less energy to cool your home, saving you real money! Mold and mildew can cause all sorts of respiratory problems for the people living in the home and wood rot can cause extensive damage to the roof’s structural member and the roof’s sheathing. Soffit vents provide air access into your attic from the underside of the house’s eaves or soffits as they are more commonly called. It should be noted that the soffit vents do not provide the total solution for adequate attic ventilation and they are only an important part of a total attic ventilation system. Most homes when constructed have vents located at the peak of the roof or as close to the peak as reasonably possible. These vents provide an exhaust portal for the hot air. But, the hot air cannot flow properly if it is not replaced with air from the outside of the home, hence the addition of the soffit vents. Even without adding powered roof vents, which can turn into a disaster if there are no soffit vents, you cannot properly exhaust the hot humid air from the attic unless you provide fresh, cooler air to replace it. Cooler air coming into the attic through the soffit vents replaces the hot humid air that is being expelled by the roof vents – a total attic ventilation system. 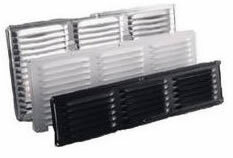 There are basically two types of soffit vents that you can install around the parameter of your home. Continuous soffit vents, as shown in Figure 1, have holes in the material from one end to the other. It is common to install continuous soffit vents when new vinyl or aluminum siding is being installed on the exterior walls of the home. Almost all of the vinyl and aluminum siding manufacturers have continuous soffit that matches the textures and colors of their sidings. 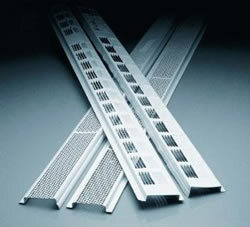 Additional information on installing continuous soffit vents. Individual soffit vents, as shown in Figure 2, are basically shields that cover an opening cut in the soffit material. They are generally rectangular grills and are available in plastic and metal in an assortment of colors, while others can be painted to match the exterior colors of the house. Whether you use continuous or individual soffit vents is not important, providing that you have as much incoming air into the attic as you do exhaust air exiting the attic. Whether or not your home has sufficient soffit ventilation can only be determined by some visual inspection. Walk around your house and look at the bottom of the soffits. Check to see if you can see vents in the soffit. Many older homes do not have any soffit vents, others may have a few but they are not sufficient to bring in enough air to replace what is or can be exhausted by the roof vents. Newer homes should have adequate soffit vents. You also need to ensure that the soffit vents have not been blocked by the addition or slippage of attic insulation. This is a common problem especially with blown-in insulation. If the area above the soffit vents is blocked, it doesn’t matter how many you have, air cannot circulate through the attic. You will have to enter your attic and inspect the areas above the soffit vents to ensure that there is free airflow. If you do not have an adequate number of soffit vents or if they are blocked you should correct the situation as soon as reasonably possible. It is costing you money! A reasonably competent handyman, with basic power tools, an electric drill and saber saw can install either continuous or individual soffit vents, it is not a difficult home improvement project; there are no special tools required. Having a helper will save a lot on the level of frustration, especially if you are installing continuous soffit. However, you are working at heights that will require a ladder of scaffolding. If you are not comfortable working at heights, you should consider employing a professional. Selection of soffit vents .